Mike Moore | The Journal Gazette Bellmont guard Meghan Busick drives in for two of her game-high 24 points in the second quarter against Norwell on Tuesday in Ossian. Busick socred 19 in the second half. OSSIAN – Make it two for two. 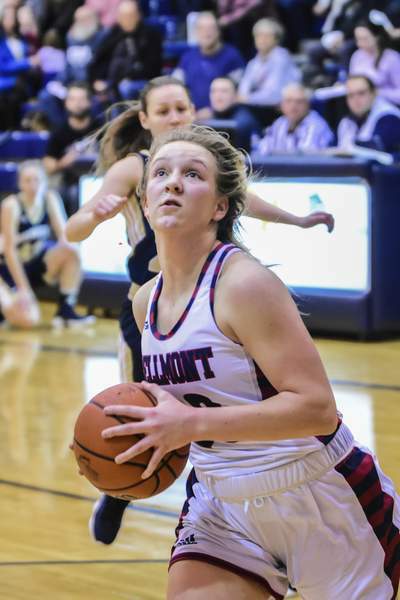 After beating Norwell for the first time in 15 tries two weeks ago, the Bellmont girls repeated the feat Tuesday night, defeating the Knights 61-51 in the first round of the Class 3A sectionals. In the prior meeting, the NE8 regular-season title was on the line. This time, the stakes were even higher, as a loser of the matchup between No. 3 (Bellmont) and No. 4 (Norwell) would find its season suddenly cut short. “The pressure was certainly on more, because it was sectionals, but at the same time we knew we had it in us and we knew we could do it, so that sort of helped us keep our cool and play our game,” Busick said. Tuesday's game played out much like the last one, a hard-fought eight-point win by Bellmont (20-2). The Knights (19-3) led 15-11 at the end of the first quarter, but Bellmont took a 17-16 lead in the second on a basket by Emma Keane, and led by two points at halftime. Busick got hot in the second half, scoring 19 of her game-high 24 points. The Knights' last slim hope disappeared with a minute remaining.Trailing by nine points, Breann Barger had possession and barreled to the hoop.But instead of cutting the lead to seven with a layup, she was called for a charge, her fifth foul. She was one of three players to foul out of the fast-paced, physical game. Grace Hunter scored 20 points to keep her high school career alive for at least one more game, and she and Busick each grabbed seven rebounds. Maiah Shelton scored a team-high 17 points for the Knights. The game was moved up by an hour in anticipation of bitterly cold temperatures Tuesday night, but the other games scheduled in the Norwell Sectional this week have already been postponed. That's nothing but good news for Bellmont, given that both rivals lost a day after their first exhausting meeting.